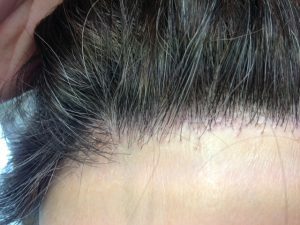 Patients who consult Sussex Trichology with Frontal Fibrosing Alopecia condition, while possibly unaware of the condition title, would complain that the front (and sometimes rear) hair line is “going back” they describe that “more forehead is visible” also that the skin “appears shiny under bright light” or perhaps that their hairdresser has pointed this out. In fact this condition can migrate back 6cm before eventually “burning it’self out” the feeling on the skin may be an itching or heat sensation, others say it’s like a prickling feeling. The reason for these sensations of this condition connected to the auto immune system is due to an inflammatory response. The permanency of the scarring hair loss is called Cicatricial Alopecia. Under a high magnification lamp, peri- follicular inflammation would be visible and is quite particular to this condition. The surrounding area can appear quite red and be accompanied with a degree of a light scale. Two differential diagnosis of this presentation (to those who rarely observe this condition) could be: a form of eczema or Alopecia Areata- although the latter never has scale with it or inflammation. The mis-diagnosis could occur as both AA and Frontal Fibrosing Alopecia (FFA) both often cause the loss of eyebrows and eyelashes. There are examples of this condition that are already well established by the time the patient consults a trichologist, although in most cases Sussex trichology can reduce the inflammation that aggravates the loss of hair there are occasions where oral medication is needed to address the most persistent form of FFA. Referrals can be made on your behalf. Unfortunately not all Dermatologists are experienced in this condition of the scalp.